Now that it’s springtime (and now that I’ve ditched my scarf for the season, I think I can officially lay claim to that statement) I’ve been craving produce that I hasn’t been available during the long (horrible, cold, snowy, crappy) winter, including artichokes. I have to say, I was really surprised by how many comments I got saying that you didn’t know how to cook a fresh artichoke. Mostly because I’m slightly obsessed with them. Well, I am here to help, my friends. 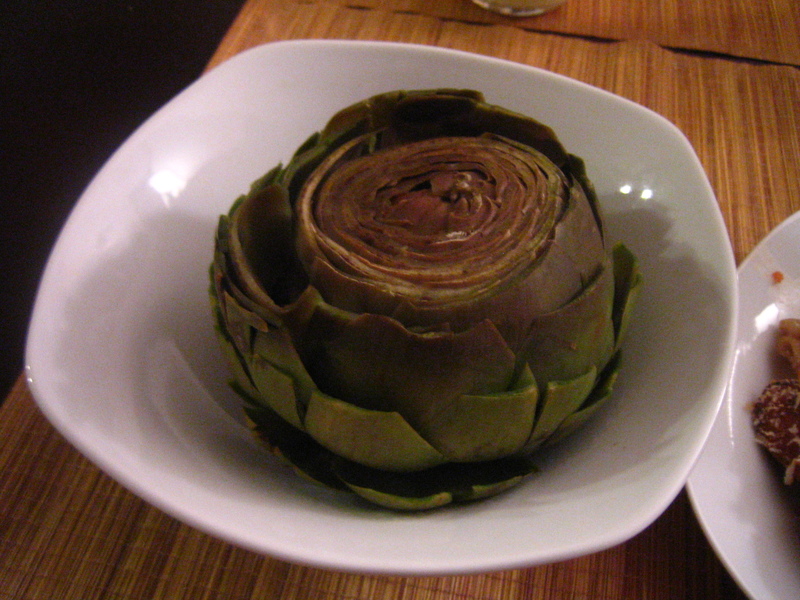 See, now this is what the artichoke is gonna look like when you pick ‘er up from the grocery store. 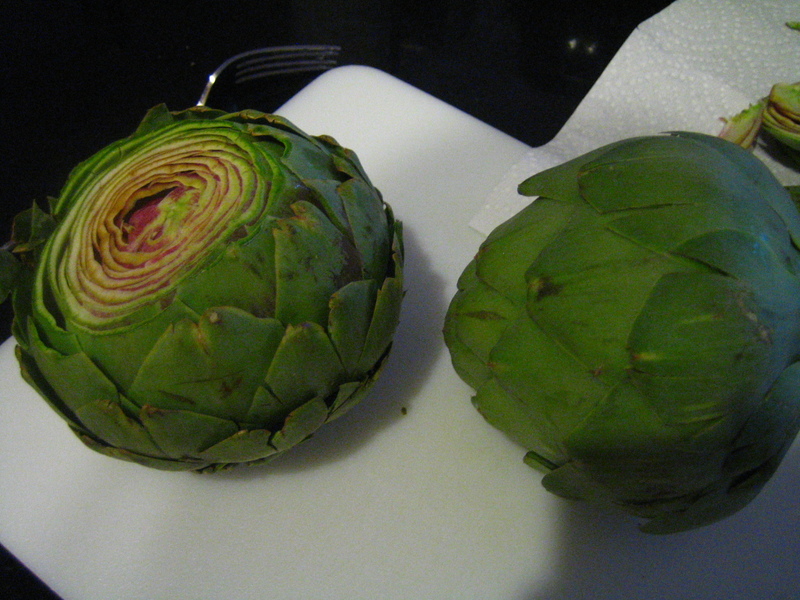 I like to pick artichokes that have large, tightly packed leaves. You’ll get more bang for your buck. When you get them home, you need to trim them up. While you’re doing this, bring a large pot of water to a boil. You’ll want the water high enough to cover the artichokes. 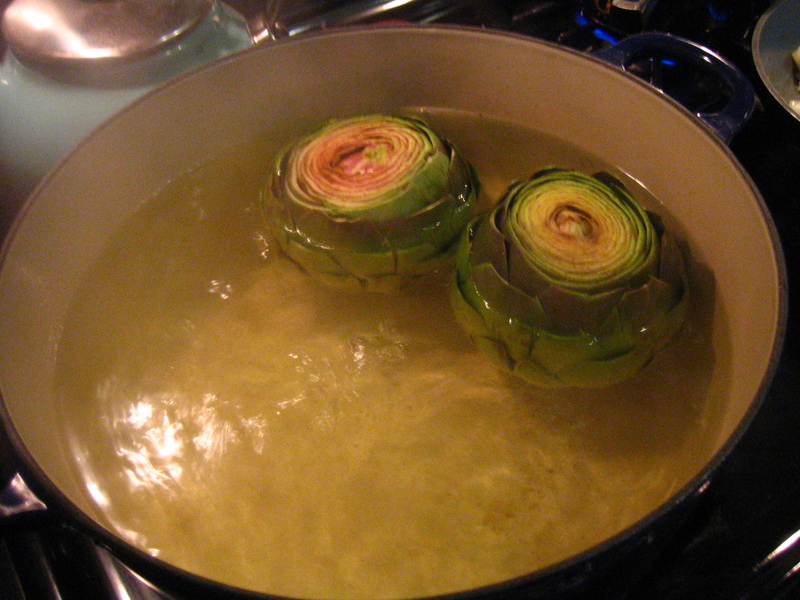 I like steaming veggies rather than boiling them for flavah/nutrient/curb appeal reasons, but artichokes need a good hot tub. They’ll take approximately 453 hours to cook if you try to steam them. Once the water comes to a boil, carefully drop the ‘chokes in and cover the pot. Now go watch some Bravo. Or make yourself an adult beverage. 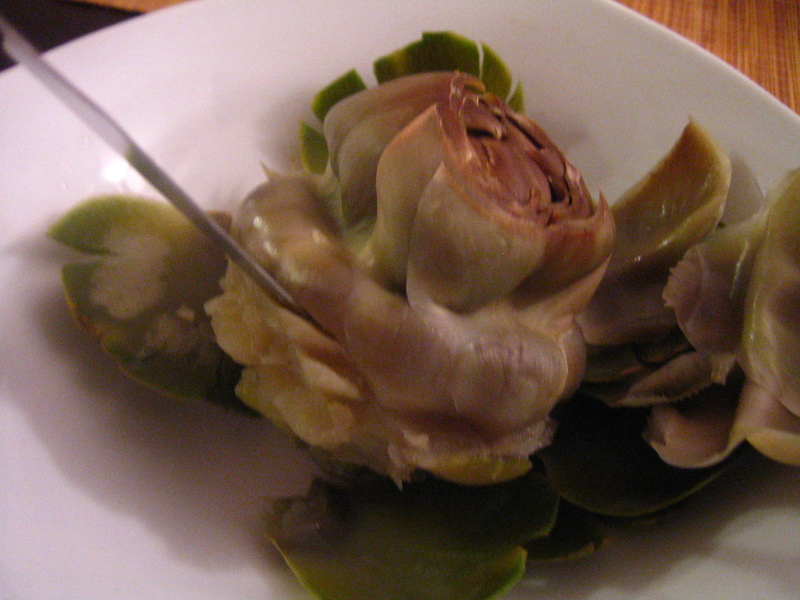 The artichokes are done when you can easily pull off one of the middle leaves. I use kitchen tongs to tug on the leaf because there’s a whole lotta steam trapped in those bad boys and I have an unfortunate tendency to burn myself pretty much every time I cook. Once they’re done, I serve them up simply with a side of mayo. Don’t be afraid of the mayo. The mayo will inspire you to be a better person. You can also serve these with some drawn butter if you’re so inclined, I won’t judge you. So here’s how you eat them: pluck a leaf, dunk it in the condiment of your choice, turn the leaf upside down and scrape the meat off the bottom of the leaf with your teeth. And throw the rest of the leaf in a “bones” bowl. It’s almost as good as eating chicken wings! Or lobster! 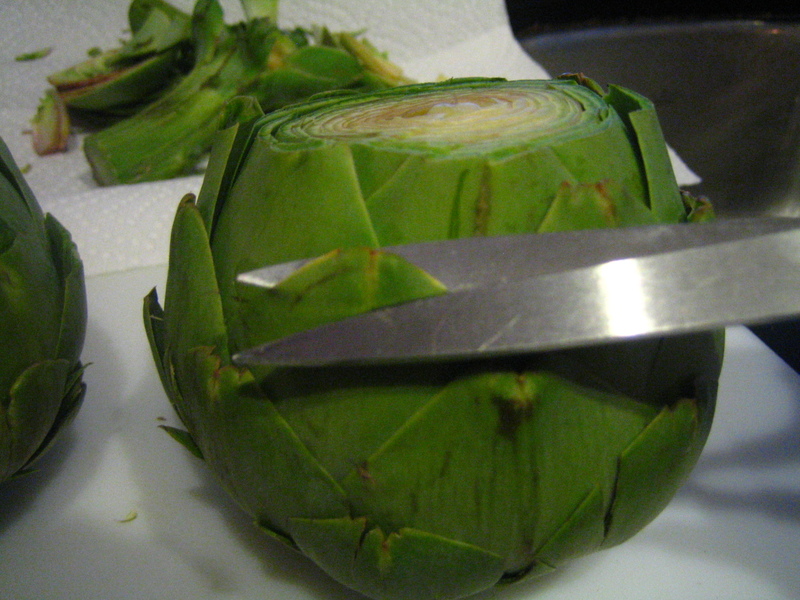 Once you’ve eaten your way around the artichoke and the leaves start getting small, thin, and relatively meatless, you’re going to have to do a leetle surgery to remove the heart. All you need to do is stick a knife just between the bottom of the leaves and the stem-stub (technical term) at a 45° angle and gently work your way around. This will remove the leaves and the prickly choke and leave you with the heart- which is the BEST part because it’s all meat. 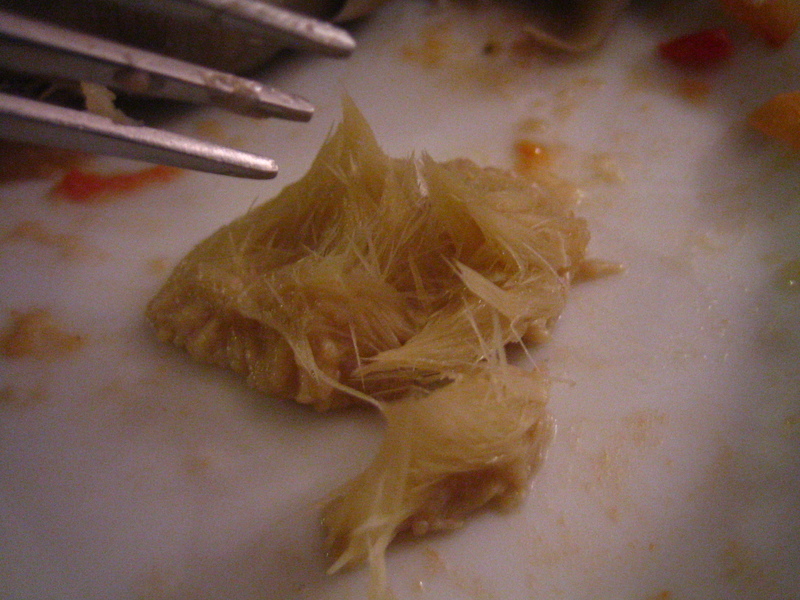 If some of the prickly part is left on the heart after you remove the leaves, just scrape ’em off with your knife, no biggie. Cut up the heart and dunk. I believe all veggies are served with mayo in heaven. But for now, I’ve always got my trusty ‘chokes. 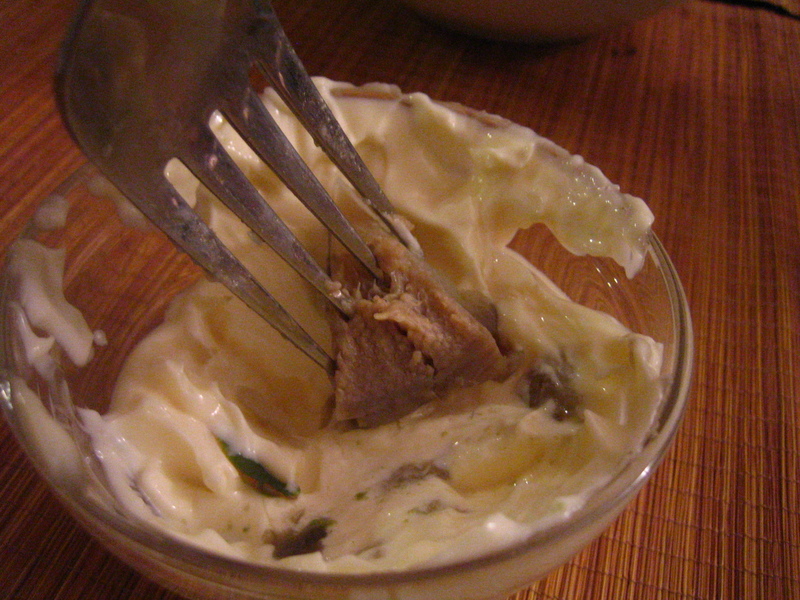 i do love eating whole chokes dipped in mayo. but always too lazy! i wonder if they sell them cut and prepped and ready for steaming? You know what’s better than eating an artichoke? 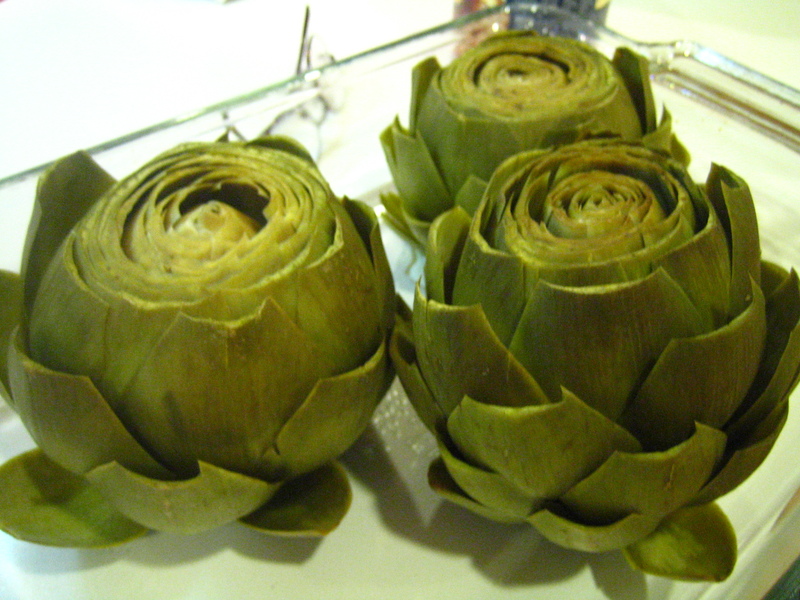 Eating TWO artichokes! Which is what I did yesterday for lunch. I do steam them, never tried boiling. 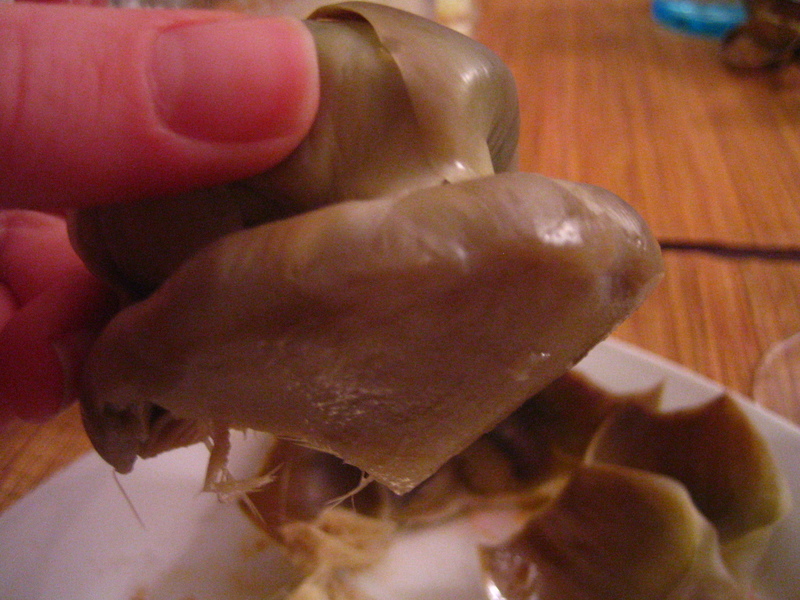 Seriously, though, steamed artichokes is one of my top 5 favorite foods of all time.The hearts, sigh, I love them so much. Or you can just buy a can of the hearts. And not dip it in mayo, because mayo is evil. I came thisclose to deleting that comment. You watch yourself with the mayo remarks! I’m so happy you did this post! I’m going to be a chokin fool now! I loooove them, but have always been too intimidated. I even saw it done at a cooking class once, but they went about it a far too difficult manner for my liking. I’ve always wanted to try this recipe where you almost make a bloomin’ onion but with an artichoke, and you use like fiber one or something much less artery-clogging than whatever they coat that delicous onino in. Perhaps I have a new project for the weekend…(in addition to mandatory naps.) Great how-to! 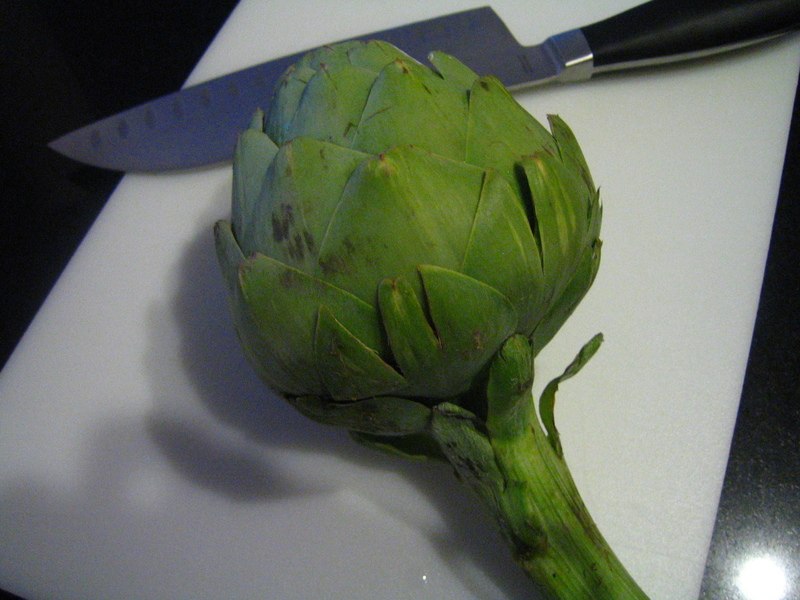 I bought an artichoke last year, and then got scared. It went bad before I decided what to do with it. Maybe this year I’ll be brave enough to actually cook one of those suckers. They’re so easy if you make them this way! Just rip the bandaid, Leah.